The first National Hockey League team to claim home ice in New York City played at Madison Square Garden and wore red, white, and blue uniforms. This team was not the New York Rangers, but they were responsible for the Rangers coming into existence, and become the Rangers’ first rival during the early years of the NHL. Enter, The New York Americans! The New York Americans were one of the first expansion teams in the National Hockey League. The club was founded by Thomas Duggan, who was awarded options for three expansion franchises in the United States in 1923. One of these franchises was awarded to New York, and was purchased by “Big Bill” Dwyer, who was the biggest and most celebrated bootlegger in New York. Tex Rickard, American boxing promoter and founder of the NHL’s New York Rangers, New York Americans’ rival. In order to bring a hockey team to New York, Dwyer paid $75,000 to purchase the Hamilton Tigers, whose players went on strike near the end of the 1924-25 season. Although Dwyer would be involved as an owner of the Americans, he needed some prodding before he was willing to purchase the franchise. 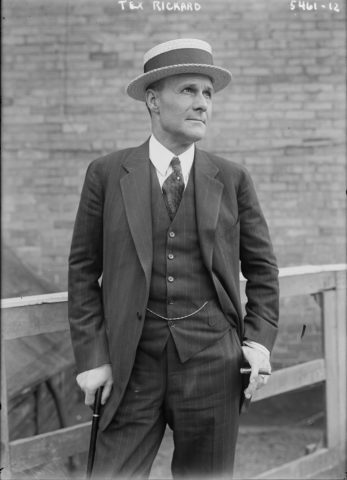 The man who convinced Dwyer to make the purchase was Tex Rickard, who was the head of Madison Square Garden. At the time, Rickard told Dwyer that he didn’t want to run a team at MSG, but he was willing to rent out the newly built arena starting with the 1925-26 season. The Americans played their first-ever game on December 15, 1925, which would be a 3-1 loss to the Montreal Canadiens at Madison Square Garden. The Americans drew over 17,000 people on opening night, and despite a difficult first season, their success at the box office never wavered. On the ice, the Americans finished the season 12-20-4, and star center Billy Burch led the team with 22 goals in 36 games. Before the next season began, Rickard went back on the promise that he made Dwyer when “Big Bill” agreed to purchase the Americans. After seeing the success that the Americans had in selling tickets with a marginal product on the ice, Rickard went out and purchased an expansion team that would play in MSG alongside the Americans. The rival team was referred to as “Tex’s Rangers”, and five months to the day after the Americans played their first game, the New York Rangers came into existence. Over the next few seasons, the Americans struggled on the ice and had trouble establishing a fan base with the Rangers coming into existence. Part of the reason for the Americans’ on-ice problems was the new two-division format that the NHL adopted after the league expanded to ten teams before the 1926-27 season. The two divisions were called the Canadian and American Division, but the Americans ended up being the only American team that played in the Canadian Division. In the 1927-28 season, the Americans finished last in the Canadian Division, while the Rangers went on to win their first Stanley Cup. 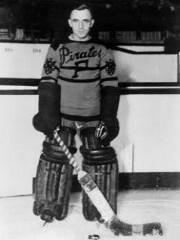 In an attempt to emerge from the Rangers’ shadow the following season, the Americans acquired goaltender Roy Worters from the Pittsburgh Pirates. Worters had an incredible season in between the pipes, as he led the Americans to a 19-13-12 record and their first ever playoff birth. Worters finished the year with a 1.15 goals against average, and became the first goalie to win the Hart Trophy as league MVP. In the playoffs, the Americans battled the Rangers in the playoffs, but lost in a two-game total goal series. The teams played to a 0-0 tie in the first game, and were scoreless through regulation of the second game until Worters let one by him in overtime of Game 2. Roy Worters of the New York Americans. The “Amerks” continued to play second fiddle to the Rangers in the standings and at the box office. After losing to the Rangers in the playoffs, the Americans missed the playoffs for six consecutive seasons as the Toronto Maple Leafs and Montreal Canadiens dominated the Canadian Division. However, that didn’t stop the Amerks from impacting the future of NHL hockey. Since they were usually the less-talented team on the ice, the Americans would shoot the puck down the ice from their defensive zone as a defensive strategy (icing wasn’t a rule yet). In the 1931-32 season, the Americans iced the puck 61 times in a game against the Boston Bruins and won 3-2. The next time the two teams met, the Bruins iced the puck 87 times as the teams played to a 0-0 draw, and ultimately led to the implementation of the icing rule. In 1935-36, under the guidance of head coach Rosie Helmer, the Americans made the playoffs for the second time in team history, even though they finished 9 games under .500. The team was comprised of a collection of young players and some aging superstars. Two of these players were Sweeney Schriner and Nels Stewart. Schriner won the Calder Trophy in 1934-35, and then led the league in points in 1935-36 with 45 in 48 games. 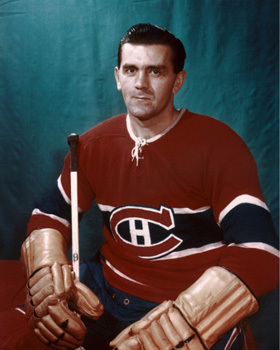 Stewart, who held the league’s goal scoring record until Maurice “Rocket” Richard broke it, had played the majority of his career with the Montreal Maroons and was already in his early 30’s when he joined the Americans. Despite barely making the playoffs, the Americans won their first ever playoff series by upsetting the Chicago Black Hawks in a total goal series, 7-5. However, the Americans would go on to lose in the semifinals against the Maple Leafs. But while the team showed signs of improvement on the ice, Bill Dwyer’s finances were in disarray. After unsuccessfully finding a buyer for the franchise during the 1935-36 season, Dwyer bailed on the franchise, and the NHL controlled the team for the ’36-’37 season. Red Dutton, who coached the Americans during the 1936-37 season, became the team’s owner starting with the 1937-38 season. Under Dutton, the New York Americans experienced the best years in franchise history. The Americans finished 2nd in the Canadian Division in 1937-38, and then beat the Rangers in the first round of the playoffs, coming back from a 2-0 deficit in the deciding third game of the series. The Americans would win Game 1 of their Semifinals series against the Black Hawks, but they lost the next two games and were knocked out by the ultimate Stanley Cup Champs. The next two seasons saw the Americans reach the playoffs, only to be defeated in the first round by the Maple Leafs in 1938-39 and the Detroit Red Wings in 1939-40. 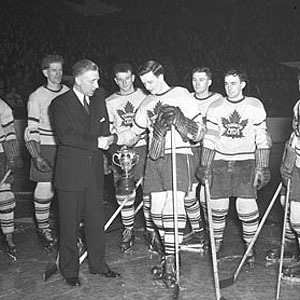 Red Dutton presents the Calder Memorial Trophy in 1944. Like other NHL teams, the Americans were affected by players leaving to fight in World War II. However, it’s tough to find a team that was hurt worse than the New York Americans were. With the club in financial trouble once again, Dutton was forced to sell his top players for cash, and the Americans finished last in the NHL with 8 wins in 48 games in the 1940-41 season. The next season, the team was renamed the Brooklyn Americans, as Dutton tried to gain fan support outside of Manhattan, where the Rangers continued to dominate the headlines and the attention of New York hockey fans. The renaming didn’t sit well with Americans fans still in Manhattan, and the team finished the season in last place. After the 1941-42 season, the Americans decided to suspend operations because of a decade’s worth of outstanding debts and player shortages during the war. This move was intended to be temporary, but was ultimately permanent. After the war ended, the NHL wouldn’t allow the Americans to re-enter the league, and the sentiment was that the Rangers played a role in not allowing the Americans to return to play. In what has become legend, Dutton allegedly said that “the Rangers will not win another Cup in my lifetime.” This became part of the Rangers’ “curse”, as they went 54 years between winning Stanley Cups (1940-1994), and Dutton was right, as he passed away in 1987. Although the New York Americans’ history in the NHL didn’t include a lot of on-ice success, their impact on the landscape of the NHL cannot be overstated. They brought the NHL to New York City, paved the way for one of the league’s Original Six franchises, and produced some of the game’s earliest superstars. This article was originally written in June, 2012.